Probably purchased from the artist December 1839 by the Apollo Association, New York; probably won at the Apollo Association annual auction December 1839 by Albert Christie, New York. William B. Bement, Philadelphia, by 1884; (his sale, American Art Association, 27-28 February 1899); purchased by J. Sterling. Mr. and Mrs. William Morrell, Cambridge, MA. (Victor Spark, New York); (M. Knoedler & Co., New York), by 1954; purchased and by exchange 1955 with the Corcoran Gallery of Art, Washington; acquired 2014 by the National Gallery of Art. Second Exhibition of Paintings, Athenaeum Gallery, Boston, 1828, no. 127, as The Poor Artist's Closet. First Fall Exhibition, Apollo Gallery, New York, 1838, no. 167 as Still Life. The Property of an Artist. Paintings and Sculpture by Living Artists, Apollo Gallery, New York, 1839, no. 50, as Still Life. Paintings and Sculpture. The Works of Upwards of One Hundred American Artists; Together with a Selection from Choice Old Masters, Apollo Gallery, New York, January 1839, no. 230, as Still Life. The Property of a Poor Artist. Paintings, &c. by Modern Artists; Together with a Choice Collection of Gems of Art, by the Most Eminent Old Masters, Apollo Gallery, New York, May 1839, no. 159, as Still Life. American Still Life Paintings, M. Knoedler and Company, New York, 1954, no. 19. Nature's Bounty and Man's Delight, Newark Museum, 1958, no. 21. Art of the United States: 1670-1966, Whitney Museum of American Art, New York, September-November 1966, no. 159. Past and Present: 250 Years of American Art, Corcoran Gallery of Art, Washington, April-September 1966, unpublished checklist. 19th-Century America: Paintings and Sculpture, The Metropolitan Museum of Art, New York, 1970, no. 20. The Paintings of Charles Bird King (1785-1862), National Collection of Fine Arts, Washington, 1977-1978, no. 42. The Object as Subject: American Still Lifes from the Corcoran Collection, Corcoran Gallery of Art, Washington, 1978, no. 1. The Capital Image: Painters in Washington, 1800-1915, National Museum of American Art, Washington, 1983-1984, unnumbered catalogue. Encouraging American Genius: Master Paintings from the Corcoran Gallery of Art, Corcoran Gallery of Art, Washington; Museum of Fine Arts, Houston; Parrish Art Museum, Southampton; Mint Museum of Art, Charlotte; John and Mable Ringling Museum of Art, Sarasota, 2005-2007, checklist no. 9 (shown only in Washington). Audubon to Warhol: The Art of the American Still Life, Philadelphia Museum of Art, Philadelphia, 2015 - 2016, unnumbered catalogue. Corcoran Gallery of Art. Masterpieces of the Corcoran Gallery of Art. Washington, 1959: 46, repro. Strong, Lisa. 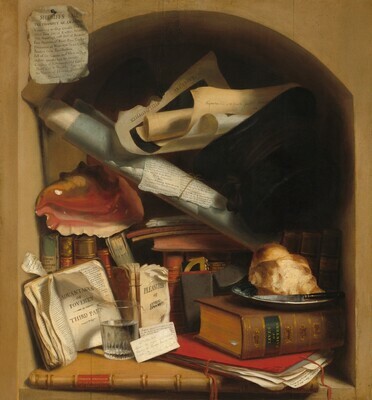 "Charles Bird King, Poor Artist's Cupboard." In Corcoran Gallery of Art: American Paintings to 1945. Edited by Sarah Cash. Washington, 2011: 64-65, 256-257, repro.